The St. Helens Lions will carry plenty of confidence into Friday's district playoff football game at home against Parkrose. The Lions appear to be hitting their stride at an ideal time. 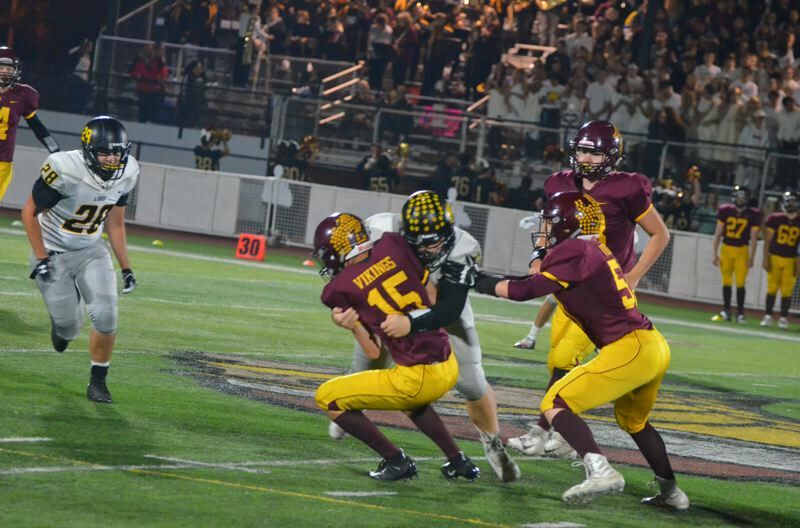 They made big plays on offense and smart adjustments on defense to win at Forest Grove last week — a victory that earned St. Helens the opportunity to play at home this Friday. Kickoff is at 7 p.m. at St. Helens High. The winner between the Lions and Broncos, both 4-4, will qualify for the 16-team Oregon School Activities Association Class 5A playoffs. The state playoff bracket will be determined by the OSAA ranking for each team. St. Helens is ranked 19th and Parkrose 21st this week, meaning the winner will travel to face one of the higher-ranked schools in the first round, tentatively set for Nov. 2. The immediate challenge for St. Helens is to deliver another strong performance in a must-win game. The Lions did that last week at Forest Grove, where a loss might have ended their season. That 41-21 road win meant a third-place finish for the Lions in the West Division of 5A Special District 1. St. Helens coach Cory Young said his team responded well to that pressure and should be ready to do it again this week. Young described the critical win at Forest Grove as "a good experience going into this week. And we get to play at home, so the kids are excited about that." St. Helens and Parkrose, which placed fourth in the East Division of Special District 1, have different approaches but appear evenly matched. Against their two common opponents, each beat Milwaukie and Wilson. Against Milwaukie, St. Helens won 21-13 and Parkrose won 21-14. Against Wilson, the Lions rallied to win 42-35 and the Broncos won 26-18. Parkrose has used an aggressive 3-4 defense to be competitive most weeks. Broncos opponents are averaging 20 points per game, only 14 if a 41-10 loss to fourth-ranked Pendleton and a season-opening 33-0 loss at Prairie (Washington) are subtracted. "They're pretty physical up front. They've stayed in a lot of games this season with their defense," Young said. "In the past, Parkrose would have to outscore people, They're playing some good defense and staying in ballgames." Parkrose has qualified for the state playoffs only five times and has never won a football state playoff game. But Young said the Broncos had the attention of his players beginning with Monday's film session. "We always say, 'Respect all, fear none.' I thought it was really important to address with the kids," Young said this week. "You know, in the past sometimes you play Parkrose and kids think we can show up and win. There's a reason this team is 4-4. They've battled. They've played some tight games. They know what they want to do and they have an identity and they do it." That identity is a versatile ground game on offense and an aggressive defense. Young said Taydrian Jackson and RJ Artis look like talented running backs for a Parkrose offense that will run out of both wishbone and spread formations. He called Jackson "probably one of the best running backs we've seen all season. Good speed. Good toughness. Good feet. We're going to have to play real well defensively, bring our lunch pail this week." On the other side of the ball, Parkrose plays a 3-4 defense (three down linemen and four linebackers). Young noted that in the West Division, most of the Lions' opponents have played four defensive linemen, two linebackers and five defensive backs. But St. Helens enters this playoff matchup with a confident offense. In their three most-recent wins — staggered over the past month with losses to sixth-ranked Scappoose and top-ranked Wilsonville — the Lions have scored at least 40 points. "Finally things are starting to click," Young said. "You need a certain amount of reps to be good at anything. You trust the process. You work on the little things week in and week out and the big things will take care of themselves. "The offense sometimes takes a little longer, and we've just been a lot sharper lately," the coach added. "Getting the ball out to our receivers or making sure we have the right shoulder on our block up front so guys don't slip off — all those little things are leading to the big things." And to a big opportunity this week.